Shes just been shown on the big screen and received a huge cheers. The crowd is about to combust! Great job so far girls. You are my favourite Herald live bloggers behind Steve Holloway. Out they go - Basset and Kopua, Medhurst and Grant, Green and Cullen, Ravillion and Langman, Hallinan and Rasmussen, Corletto and Tutaia, Geitz and Mes. Blimey she's a bit tense! Me and the crowd that is, not the Ferns! Laura Langman to take the first centre pass. And we're away! First one in for Tutaia. Two early penalties against Geitz, both converted by NZ. First shot for Mes and she nails it from quite a distance. @Kiwi: Good question. We were just asking that too. They did them in the opening matches for each team but nothing since. First turnover goes to Australia. Geitz with the tip from behind. Convert the turnover and score from their own Centre, so Australia takes the first advantage. Rasmussen with the fumble and Aussie get it back. Cullen wins it back for the Ferns after a strong zone defence again. rebounds and turnovers crucial;we can win this.stay composed and pressure them. Mes comes up short, Aussie gets the remind and the noise is deafening! Ferns defence not able to pick up much at the moment, Aussie attack far crisper than last Sunday. First Bledisloe then ! ..... I can't stand it ... go girls ! Handy advantage now for Australia. NZ with possession but Geitz pulls in a ripper after a forced pass by Langman. Cullen with the tip to win it back, but again thrown away by NZ. Bassett all alone under the post and the Ferns call time. The Aussies are on their feet. The team huddled in the middle of the court, not going over to the bench. Defence heavily penalised for NZ so far. Grant with seven alone, means the Aussie shooters are getting too much easy ball. we are handing then too many opportunities. That's a big early lead for Aust with 6 minutes in the quarter. 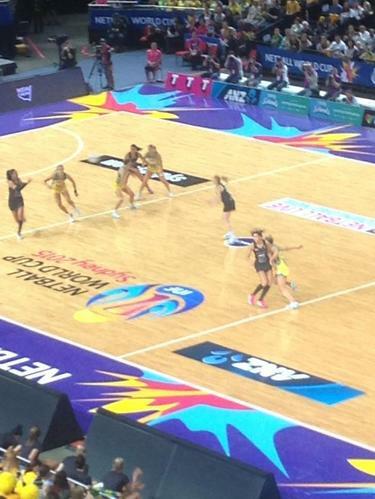 common Silver Ferns, dont choke, gotta give aussies a bad weekend in sport! Tough start to the match for Grant as she's pinged again. A looott of whistle down that end, and there is little Kopua can do to stop the the two on one. Really quick second phase from Australia, wheres NZ attack is under a lot of stress. Beautiful roll away from Mes, misses the shot and the second attempt under pressure from Geitz. Luck going against NZ too - deflection from Kopua bobbles of Grant's legs and out of court. And now a held ball against Tutaia. Ferns can't take a trick. Wow this is a heck of a start from Australia. Attack has lost it's pace. NZ needs ball speed around the circle, and the Aussie defence is stifling them. Tutaia forced to go long and misses. Less than a minute to go in the quarter, but now Aussie throw one away. hang in there team;must cut the error rate fast.